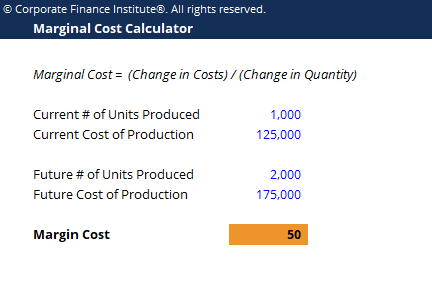 Marginal cost represents the incremental costs incurred when producing additional units of a good or service. It is calculated by taking the total change in costs of producing more goods and dividing that by the change in the quantity of good produced. The usual variable costs included in the calculation are labor and materials, plus the estimated increases in fixed costs (if any), such as administration, overhead, and selling expenses. The marginal cost formula can be used in financial modelingWhat is Financial ModelingFinancial modeling is performed in Excel to forecast a company's financial performance. Overview of what is financial modeling, how & why to build a model. A 3 statement model links income statement, balance sheet, and cash flow statement. More advanced types of financial models are built for valuation, plannnig, and to optimize the generation of cash flowCash FlowCash Flow (CF) is the increase or decrease in the amount of money a business, institution, or individual has. In finance, the term is used to describe the amount of cash (currency) that is generated or consumed in a given time period. There are many types of CF.